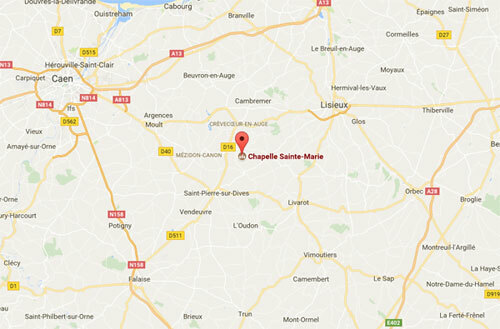 The chapel is between the Pays d’Auge and the Plaine de Caen. Hidden away in the green valley of the Viette far from the main roads, in the commune of Mézidon Vallée d'Auge (Calvados). The chapel of Sainte-Marie-aux-Anglais was built in the late 12th and early 13th centuries. It has changed very little since then and it represents a perfect example of religious architecture of the late Romanesque period. Probably around 1240, the interior was covered with paintings of both religious and secular inspiration that show us the environment and the lives of people at that time. These murals were done by a local workshop which remains anonymous ; their simplicity and elegance still have the power to move us today. Although "prestigious" monuments have often been maintained and preserved but with modifications, this was not the case for this rural chapel. It remains very close to what it was in the 13th century. In the middle of the 19th century the chapel started to deteriorate, but was saved by the intervention of the French Archaeological Society. It was classified as a Historic Monument in 1910, and since has been the subject of various partial restorations. Le Mesnil-Mauger, now part of the municipality Mézidon Vallée d'Auge, has a real gem in this chapel and we would like to ensure its sustainability to transmit it to future generations. 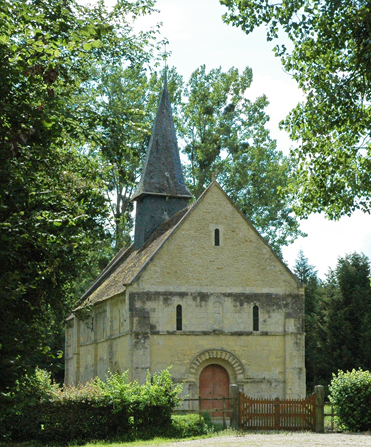 An association has been created 'to conserve the Chapel of Sainte-Marie-aux-Anglais' (in brief C.C.S.M.A.). Its aim is to undertake whatever restoration work is necessary on the chapel and its paintings under the supervision of a senior architect from the Department of Historic Monuments. The restored chapel will be open to visitors and will be able to accommodate exhibitions and concerts. Nothing can be achieved without the broad support of the people of Mézidon Vallée d'Auge and all those interested in local history. If you are one of these people, click on the ‘Help to Conserve’ tab to find out more about our Association and how to become a member ! Click here to download the last newsletter of the association (in french language). News about the association are published on its Facebook page. Click on the "f" on the right ! You can send an e-mail to the Association by clicking here (or, if your browser does not allow it, send an e-mail message directly to : ccsma@orange.fr). The Commitee of the association 'To conserve the chapel of Sainte-Marie-aux-Anglais' and its president wish you an happy new year and hope to meet you when they will propose visits of the chapel and events. The watercolour painting The chapel of Sainte-Marie-aux-Anglais at the time of its construction was kindly realized by Annick Kohn, member of the association and painting teacher in Villennes-sur-Seine. Our association CCSMA received the Prix de la rédaction Pèlerin awarded to the wall paintings of the chapel, in the framework of the 2018 edition of the grand Prix Pèlerin du patrimoine, whose goal is to highlight french cultural and religious heritage. A ceremony took place on October the 23rd, in the Grand Palais parisian building, in the presence of Stéphane Bern. Click on the logo, on the left, to read more information (in french) and here to view the nice video which has been realized for this circumstance, showing paintings of the chapel with comments by Jacques Devos.